The playoff field is down to five, with another elimination coming tonight as the San Jose Sharks and Nashville Predators battle for the final spot in the conference finals. The Pittsburgh Penguins and Tampa Bay Lightning will face off to determine who will represent the Eastern Conference in the Stanley Cup Finals. The Penguins went through the Presidents' Trophy winning Washington Capitals to reach this point, and they'll need to go through the 2015 Eastern Conference Champs to advance further. It'll be a match-up that pits speed against speed, two goaltenders who have been playing excellent hockey in the playoffs, and a couple teams that have no trouble putting the puck into the net. Like their possession numbers, Pittsburgh has seen its scoring offense progressively increase under Mike Sullivan, to the point where after facing Henrik Lundqvist and Braden Holtby they're still averaging 3.68 goals per game over their previous 25 games. The Pens' offense is hot right now, and their scoring defense is following suit, having allowed 2.2 goals per game over that same time frame, giving them an absurd 1.48 goal differential per game over that time frame, which would equate to a +121 goal differential over the course of a full season. To put that into perspective, it's been 20 years since a team has sustained that level over the course an 82 game schedule, when the Detroit Red Wings had a +144 differential during a 131 points regular season that saw them fall 1 point short of the record. After a rough start of the year offensively, the Lightning have rebounded over the second half of the season and have topped the 3.0 goal per game mark for stretches late in the season. They've tailed off a bit later in the year, but Tampa has scored 30 goals in 10 postseason games, albeit against weaker competition. Both teams have managed high shooting percentages with good save percentages for large stretches of the season, and it's not surprising that both have taken advantage of a high postseason PDO to advance this far. The Lightning have a 103.8 PDO through their 10 games, while the Penguins aren't far behind with a 103.2 PDO of their own. A large part of the Stanley Cup Playoffs is being lucky in addition to being talented, and these two teams have managed both through the first two rounds. Tampa Bay completed a series sweep of Pittsburgh during the regulation, winning all three games by a combined 15-9 score. It's not all bad news for the Penguins though as it'll be a much different team that lines up across from the Lightning for Game 1. The Pens had suffered a rash of injuries during the stretch of the season where these games occurred, facing Tampa without Nick Bonino for all 3 games, without Eric Fehr and Evgeni Malkin for 2, and the first game happened before the Carl Hagelin trade. To show how far things have come, Kevin Porter was in the lineup for all 3 games, Jeff Zatkoff started the last game, and Marc-Andre Fleury played poorly in the first two. Despite the injuries, Pittsburgh still had a score-adjusted 55.4 CF% during the three games against the Lightning, and they did average 3 goals a game against Ben Bishop without a good portion of their depth. Further complicating matters for Tampa will be the availability and effectiveness of Steven Stamkos and Anton Stralman for the ECF, as the two combined for 5 goals and 5 assists in the 3 regular season games. The big story for the Tampa Bay Lightning entering the Eastern Conference Finals is when they'll be able to get Anton Stralman and Steven Stamkos back into the lineup. Game 1 will mark 7 weeks for Stralman since he broke his fibula in a regular season game against the Islanders - past the 6 week prognosis originally given with the injury. 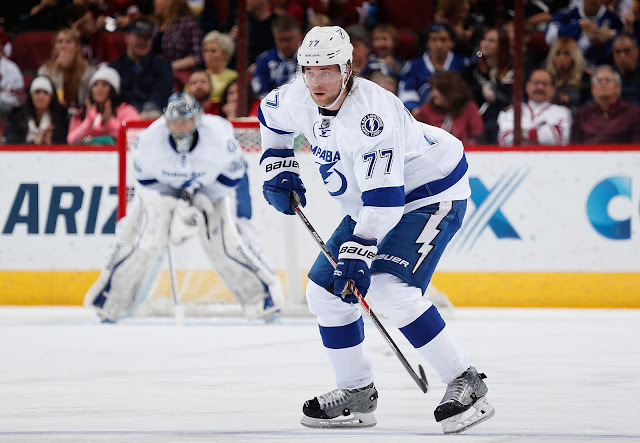 Stralman practiced with his teammates in a regular jersey, but Lightning Head Coach Jon Cooper was noncommittal towards his status tomorrow night. Getting Stralman back in the lineup would be huge for Tampa, as he and Victor Hedman combine to form one of the best defensive pairings in the league when healthy. While Stamkos skated with his teammates, he continues to wear a no contact jersey, a situation that won't change until after the doctors take him off blood thinners to treat his blood clots. His availability for the series is highly questionable, but in his absence the Triplet Line that generated so much attention last year is back together and performing well. Nikita Kucherov led the Lightning in scoring this season with 66 points, and so far during the postseason he's stepped his game up another notch with a league-leading 9 goals in 10 games. Fellow linemate Tyler Johnson leads the team with 13 points and has bounced back from a disappointing regular season that saw him net 14 goals and 24 assists a year removed from a 29 goal, 43 assist campaign. Like Johnson, Odrej Palat also regressed some from the 2014-15 season, scoring 40 points a year after putting up 63, but unlike Johnson, Palat hasn't had the strongest of showings in the postseason up to this point (2g, 2a). Ben Bishop is a finalist for the 2015-16 Vezina Trophy, the second nomination of his career, but the argument could be made that the Pens have already faced two tougher challenges in the first two rounds in Braden Holtby and Henrik Lunqvist, posting a 3.36 goals per game average in the process. That being said, Bishop's 0.938 SV% and 1.89 GAA are both best among all goalies still alive in the playoffs, and with a 0.926 SV% and 2.06 GAA from the regular season the Penguins will need to continue driving play and converting the prime chances they generate. A big part of the reason why Bishop is in a position for success is the play of Victor Hedman in front of him. Hedman was drafted 2nd overall by Tampa Bay in 2009, and he's blossomed into the type of defender the team envisioned when they selected him. Hedman had 47 points (10g, 37a) this year in the regular season, and he's followed that up with a strong postseason (4g, 5a) to help the Lightning eliminate the Red Wings and Islanders in 5 games apiece. Couple that with a 57.1 SACF% and a 61.9 GF% and Hedman is one of the most well-rounded, elite defensemen in the entire league.